Two-year-old filly Dancer's Tale (NZ) looks assured of a coveted spot in the 2013 $1 million Karaka Million (Res.L) (1200m) with an eye-catching performance to win the $50,000 Listed Barneswood Farm Agistment Welcome Stakes (1000m) at Riccarton on Saturday. Taking an early lead in the Karaka Million Order of Entry (ranked by prize money earned) after winning on debut at Wanganui in September, Dancer's Tale (Tale of the Cat x Pineau) has reclaimed the lead with $40,435 in stakes. The Listed Wellesley Stakes winner Ruud Awakening (Bernardini), the Order of Entry leader before Saturday's race, now sits in second place with $32,500 in stake money earned. Trained by Murray Baker & Andrew Forsman, Dancer's Tale looked in all sorts of trouble at the top of the straight, boxed in on the rail with jockey Michael Coleman trying to find clear racing room. But Coleman elected to take the rails run and it paid dividends as Dancer's Tale burst clear just short of the post to win by a long neck. Dancer's Tale is raced by Challenge Racehorse Syndications Ltd (managed by Adrian Clark) and has now won two of her three race starts for $40,435 in stakes. Dancer's Tale is the 80th stakes winner for her sire Tale of the Cat whose progeny have earned over $113 million worldwide. 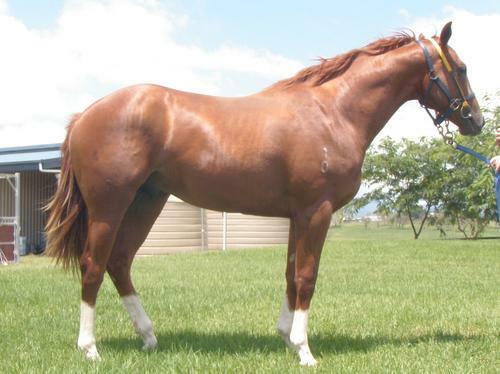 Delbridge Racing is offering shares in a Tale of the Cat colt (pictured) trained by Bruce Hill.